There’s a good chance that you (and too often, me) are among the one-third of Americans who don’t get enough sleep according to a 2016 CDC study. I know better. Yet for the past couple of months, bedtime got away from me. Because I’m more of a night person, it’s way too easy to get sidetracked. My body has been telling me it’s time to get back on track. It’s not hard. But it needs to be a conscious priority, every day. There’s honestly nothing else going on at night that is more valuable to improving your health and mental clarity than getting enough sleep. Remember that when your to-do list keeps you up all night. The great news is that with simple tweaks to your bedtime routine, you’ll not only sleep better, but wake up with more energy and focus, reduce the risk of heart disease, stroke, diabetes and chronic inflammation. Why not give some of these tips a try? It’s not just how many hours you sleep that matter, but when you sleep. Most people feel their best with 7 - 9 hours of sleep. The CDC recommends a minimum of 7 hours. That means in bed, lights out, sleeping. Not scrolling through your phone or reading. Here’s a secret to getting more sleep without even changing bedtime: when I moved the phone out of my arm’s reach, I got about 45 minutes more of sleep each night. That’s another 5 hours of sleep in a week. Easy win! Hectic schedules make even 7 hours a night a tough challenge. But health wise, it’s worth making sleep a priority. To maximize the restorative and healing benefits of sleep, aim for lights out by 11pm. I know that if I’m not upstairs before the 11 o’clock news comes on, I’m going to get sucked into the news. And if I stay up till 11:30, it’s too hard for me to walk away from Jimmy Kimmel. I need to get upstairs earlier, or I’m sunk! This remains one of my biggest challenges. Hormonal imbalances can wreak havoc on sleep and feeling rested. When I struggled with adrenal imbalances, I couldn’t stay awake in the afternoon and fell asleep right after dinner. Around 11:30pm, I’d get a second wind and was wide awake until 2 am. It went on for years. That’s how my family was growing up, too. I thought it was normal. It tortured my husband who spent years trying to either get me to stay awake (no way!) or go to sleep earlier (no way!). Finally, after researching, I learned that I needed to find a health professional to help me get to the root cause. It is SO nice to have a normal sleep pattern, and to know that I’ve resolved serious health concerns. Sleep apnea is another condition that affects sleep quality. If snoring is a concern for you or your partner, speak to your doctor. Sleep apnea is more than just being a loud snorer. It’s a medical condition that should be investigated and treated by a doctor, and there options to protect your health. Cut back on water and other drinks in the evening so you can hopefully sleep through until morning. Watch the bedtime snacks. Sugar at night creates blood sugar spikes. The real culprit behind needing the bathroom in the middle of the night could be that bedtime cookie or bowl of corn chips. Try cutting out the late-night sweets and carbs, and see what happens. Coffee, chocolate, energy drinks, alcohol, certain medications and supplements can affect sleep. Stop caffeine after 2 or 3pm, maybe earlier. If you wake up regularly, is it always around the same time? If you’ve ruled out caffeine, sugar or a crying baby, it may be worth checking with a doctor to investigate. Over the past couple of months, I somehow let the phone creep back into my nighttime routine. I’ve been paying for it with more distractions and less sleep. I’ve also noticed that reading on the phone has affected my attention span. It’s too easy to keep scrolling and clicking mindlessly. The phone is off limits in bed again. I already feel better. I’m finally getting through a couple of books that have been piling up. There are lots of benefits to cutting back screen time! Once I pick up my phone to check the weather, it’s all over. Next, I’m checking out cute dogs on Instagram or reading a news story that’s guaranteed to rev me up. Not to mention that I’ve been known to wake my husband to share something that simply can’t wait until morning! The National Sleep Foundation recommends no electronics in the bedroom, and no electronic use for at least an hour before bed. Try this. I bet you’ll be surprised at how much of a difference it makes. Set your phone on Do Not Disturb. I set mine so that Favorites will still come through in case of emergency, as I’m on 24/7 call for an organization I work with. It filters out nonessential calls and texts during the night. Instead using your phone or iPad in bed, read an old-fashioned book. The blue light coming from phone and computer screens disrupts melatonin, a hormone that signals your body that it’s time to sleep. Minimize temptations by putting your phone in another room, if possible. If not, keep it out of reach so that you’re not tempted to use it before bed or during the night if you wake up. No television in the bedroom, or at least no watching TV for at least an hour before bed. We’ve never had a TV in our bedroom. TV used to feel like a treat when I was traveling, but I doze off and wake up with the glow of the television feeling crabby and crummy. So…no go on the TV for me even when it’s there. Work with the natural circadian rhythms rather than fight them. The internal body clock restores and replenishes different organs during the night. If you’re up really late, you’ll interfere with the healing properties of sleep. Help your health by getting to bed and letting your body optimize its maintenance work. Not everyone needs the same amount of shut-eye. Tune in to listen to when your body feels tired. Go to bed and wake up at about the same time, weekdays and weekends. Start dimming lights about an hour before bed to send the message that it’s time to wind down. Do it manually, use Alexa or whatever home system you have. Set a bedtime alarm on your phone or Alexa. When mine goes off, know I’ve got 20 minutes to wrap up everything for the night. Set out whatever you need to make the morning run smoothly. Keep a notepad and pen by your bed in case you think of something important during the night. Jot it down, and let it go. Keep the bedroom cool, tranquil and dark at night for sounder sleeping. If you’re a light sleeper, try a sound machine for some background white noise. Lavender essential oils at night create a restful environment. I made a calming lavender linen spray. Or, diffuse lavender essential oil. Sleep in your bed. Not on the couch. Not in your kids bed for a few hours after storytime. When I was an exhausted mom of two babies, I didn’t realize how much I was compromising my rest by cuddling up and falling asleep with them only to drag myself up an hour later. Uninterrupted sleep is the goal. A simple gratitude practice before you drift off to sleep will set the peaceful tone for your evening. Whether it’s a meditation, or writing down 3 things that you’re grateful for, you’ll be that much more peaceful and relaxed. What else can I say about the virtues of great sleep? Plenty! It’s healthy, restful and completely free. By getting 7-9 hours of quality sleep, you’re giving yourself a wonderful gift. There’s nothing else that I can think of that will help to restore your mind and body, and improve your health and memory. 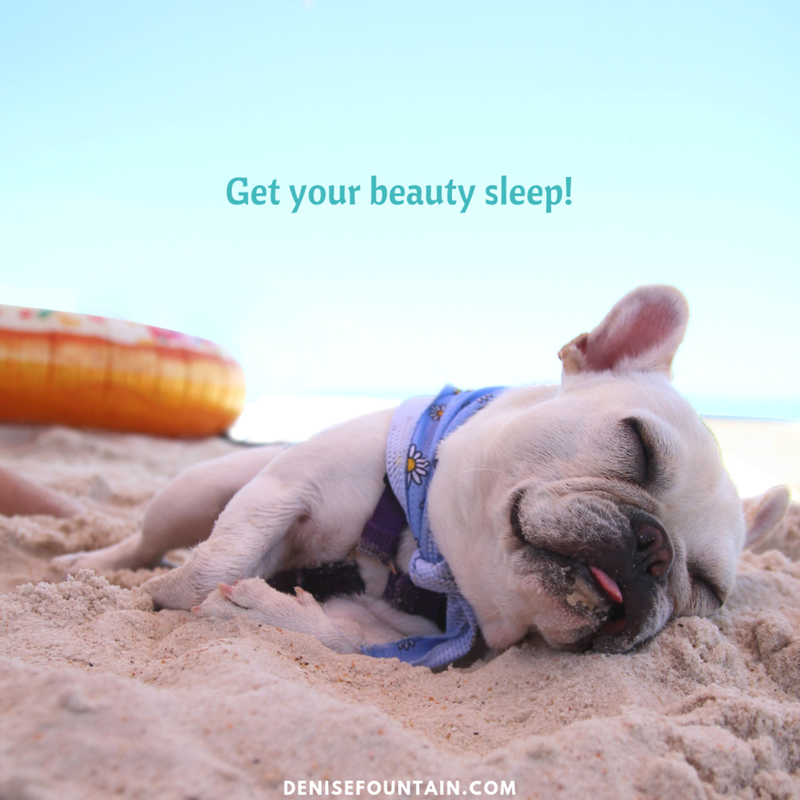 If your lifestyle is stressing you out, and you’d like help in trying to balance the many pressures that are keeping you up at night, set up a chat with me at denise@denisefountain.com or sign up for a Clarity Call. I can help you to create more balance and joy in your life so that you can finally sleep at night. Wishing you wonderful dreams at night, and well-rested days!